The Broadway hit Wicked continues to enchant audiences all across the country. In "The Wizard and I", Elphaba dreams of the life before her and her dreams for the future. The stirring ballad "For Good" reminds us of the positive influence we can have on others. ... I have been changed for good. 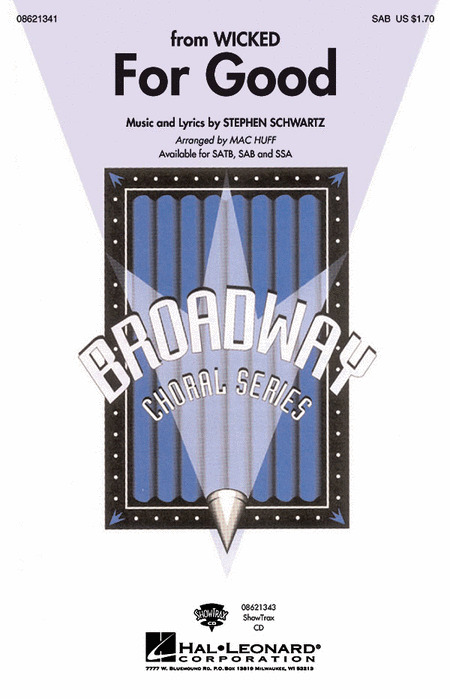 "Defying Gravity" is a showstopper and will be an instant favorite with your choirs. Filled with hope and determination, the powerful lyrics speak to all ages. "What is this feeling?" Not love, but loathing, unadulterated loathing! 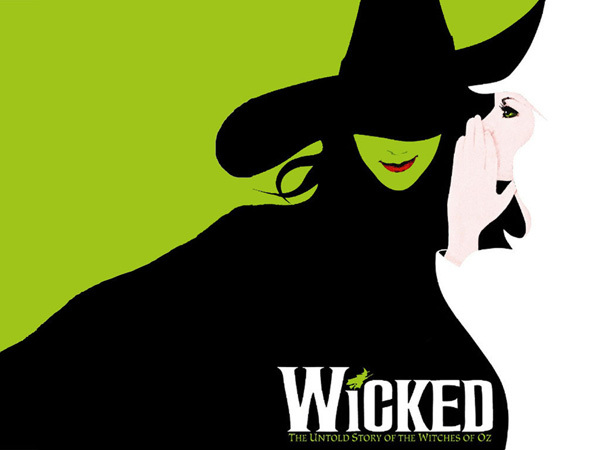 Your SSA groups can show a little attitude with this fun and funny number from the Broadway smash hit Wicked. A fantastic change of pace! "I'm Not That Girl" is a delicate song of self discovery, this expressive ballad will be a wonderful selection for SSA groups. Piano accompaniement. Songlist: Popular, I'm Not That Girl, For Good, Defying Gravity, The Wizard and I, One Short Day, What Is This Feeling? Nominated for a whopping 10 Tony Awards, Wicked is the Broadway smash of 2004! A prequel to the all-American classic The Wizard of Oz, this new musical is a character study of Elphaba and Glinda, school roommates who grow up to become the Wicked Witch and the Good Witch, respectively. 13 fantastic tunes: As Long as You're Mine - Dancing Through Life - Defying Gravity - For Good - I Couldn't Be Happier - I'm Not That Girl - No Good Deed - No One Mourns the Wicked - One Short Day - Popular - What Is This Feeling? - The Wizard and I - Wonderful. Now even beginning pianists can play their favorite songs from Wicked! This folio features big-note arrangements of 12 tunes, including: As Long as You're Mine - Dancing Through Life - Defying Gravity - For Good - Popular - What Is This Feeling? - The Wizard and I - Wonderful - and more. 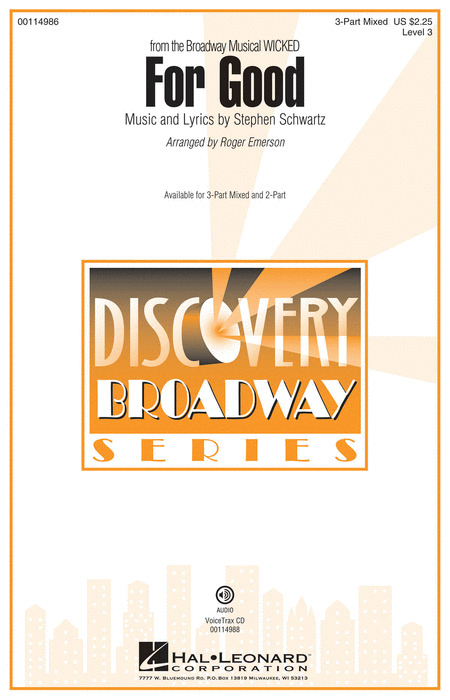 Songs in the Broadway Singer's Edition include the vocal line and lyrics paired with faithful reductions of the orchestral accompaniments. The songs are presented in their original keys with piano accompaniments carefully crafted for playability. 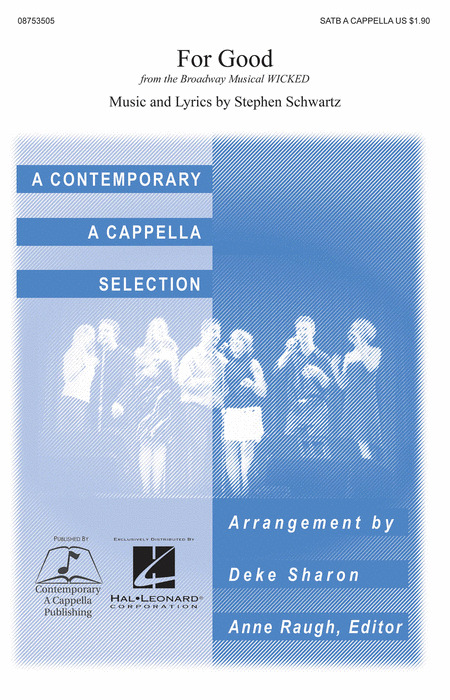 The CD includes performances of these piano accompaniments. The disc works in any CD player and is also enhanced for computer use, allowing adjustment of both tempo and pitch. Includes these hits from Wicked: Dancing Through Life - Defying Gravity - For Good - I Couldn't Be Happier - I'm Not That Girl - No Good Deed - Popular - What Is This Feeling? - The Wizard and I - Wonderful. Nominated for a whopping 10 Tony Awards and grossing more than $1 million each week, Wicked is this year's Broadway smash! A prequel to the all-American classic The Wizard of Oz, this new musical is a character study of Elphaba and Glinda, school roommates who grow up to become the Wicked Witch and the Good Witch, respectively. We are very proud to offer two songbooks featuring this delightful music: a Vocal Selections book which contains the vocal line with piano accompaniment (00313268), and a Piano/Vocal Selections book, in standard piano/vocal format with the melody in the piano part (00313267). Both songbooks feature a special section of color photos from the production, a note from composer/lyricist Stephen Schwartz, and these fantastic tunes: As Long as You're Mine - Dancing Through Life - Defying Gravity - For Good - I Couldn't Be Happier - I'm Not That Girl - No Good Deed - No One Mourns the Wicked - One Short Day - Popular - What Is This Feeling? - The Wizard and I - Wonderful. Nominated for a whopping 10 Tony Awards in 2005, Wicked is an undeniable Broadway smash! A prequel to the all-American classic The Wizard of Oz, this new musical is a character study of Elphaba and Glinda, school roommates who grow up to become the Wicked Witch and the Good Witch, respectively. We are very proud to offer several songbooks featuring this delightful music, including a Vocal Selections book which contains the vocal line with piano accompaniment (00313268), and a Piano/Vocal Selections book, in standard piano/vocal format with the melody in the piano part (00313267). 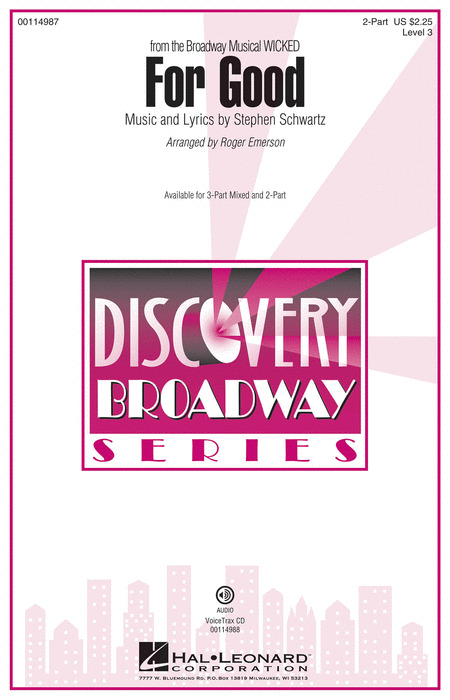 Songbooks feature a special section of color photos from the production, a note from composer/lyricist Stephen Schwartz, and these fantastic tunes. 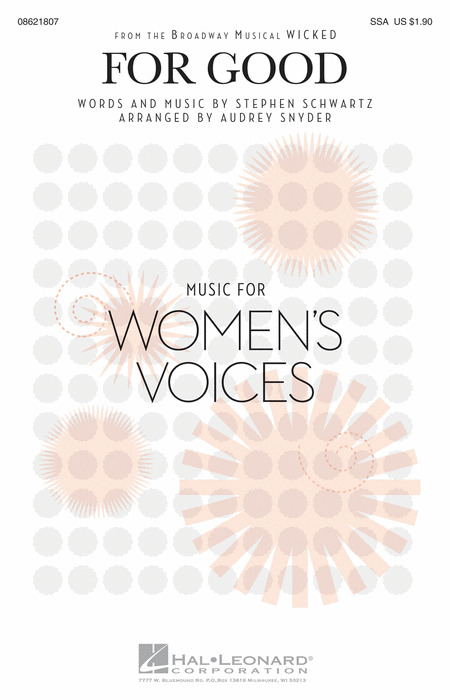 Now available in a Discovery Series edition that accommodates young voices, this stirring ballad reminds us of the importance of friendship and of the positive influence we can have on others. Now available in a 2-Part voicing! From the Broadway smash hit Wicked, this stirring ballad reminds us of the positive influence we can have on others. I have been changed for good. From the Broadway smash hit Wicked, this stirring ballad reminds us of the positive influence we can have on others. ... I have been changed for good.Available separately: SATB, SAB and SSA. ShowTrax CD also available. Performance time: Approx. 4:30. The expressive ballad from the musical Wicked by Stephen Schwartz in a setting for unaccompanied SSAA voices takes on new richness and meaning with solo lines and full vocal ranges. An outstanding selection with a deep and emotional message. Duration: ca. 4:30.